The next speakers in our student seminar series will be Philippe Dupuis and Yannick Cormier . Philippe and Yannick will be giving a talk entitled “Production and Flow Characterization of Pyramidal Fin Arrays using Cold Gas Dynamic Spraying” and “Performance of Pyramidal Fin Arrays”, respectively. Energy efficiency has become a growing concern in a world driven by a fossil fuel economy. To this end, increasing the performance and decreasing cost, weight and volume of gas turbines has become a critical research focus. Heat exchangers such as recuperators and intercoolers help improve the efficiency of gas turbines by recovering the waste heat generated by this process. Compact heat exchangers with unit cells using wire mesh as the internal heat transfer surface have been developed at Brayton Energy Canada, but several difficulties are encountered with conventional joining techniques. Cold Spray was successfully used to deposit an outer layer and the current study focuses on the viability of depositing fins on this outer layer. Due to process restrictions, the pressure drop across the fin array needs to be minimal, while maintaining a very high heat transfer rate per unit area. The focus of this study is the manufacturability of pyramidal fin arrays produced using the cold spray process. This work also includes a section regarding the relevant background information on gas turbine generators and heat exchangers. The cold spray process is also detailed, and the technique used to obtain near-net shaped pyramidal pin fin arrays of various sizes and fin densities is discussed. The Particle Image Velocimetry flow characterization method has been used to determine the flow structures around the pin fin arrays and is discussed. This work studies the heat transfer and fluid mechanics performance of pyramidal fin arrays produced using the cold spray process. Empirical correlations were determined between the Reynolds number and the Nusselt number for these shapes of fins. These relations were used in a numerical model in order to determine the most appropriate fin array geometry, depending on target specifications, fluid input conditions and spatial constraints. The fins produced using the cold spray process outperform traditional straight-cut fins at the same fin density due to increased fluid mixing and turbulence caused by the discontinuity of these features. The adhesion strength of the fins has also been quantified. The effects of varying fin height, base dimensions, spacing and densities of these pin fins have been characterized for both the thermal performance and for adhesion strength. Yesterday, Amir Behnamian gave his Ph.D. ’s thesis seminar. The next speaker in our student seminar series will be Amir Behnamian. 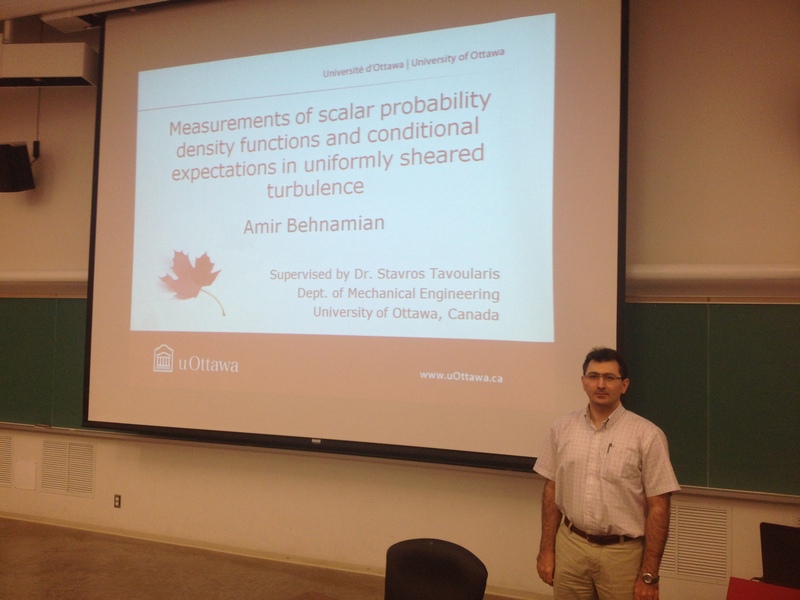 Amir will be giving a talk titled “Measurements of scalar probability density functions and conditional expectations in uniformly sheared turbulence”. High resolution, multi-sensor, hot/cold-wire measurements were made in passively heated, uniformly sheared turbulence in a wind-tunnel. Measurements were focused on terms in the scalar PDF equation that require closure models. Unlike previous studies, which considered a single combination of velocity and scalar fields at a time, we investigated three different scalar fields embedded in the same nearly homogeneous turbulence with three passively superimposed temperature fields, namely a transversely homogeneous temperature field with a uniform mean gradient, and two inhomogeneous temperature fields, the plume of a heated line source and a thermal mixing layer. The use of uniformly sheared flow allowed us to isolate the effects of scalar inhomogeneity and initial conditions by evaluating the results in the three scalar fields. Thus, the measurements covered a wide range of scalar field conditions and set the ground for a conclusive comparison. Yesterday, Scott Audette gave his M.A.Sc.’s thesis seminar.